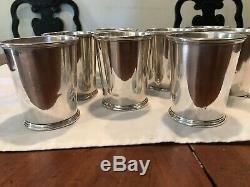 Kirk & Son Sterling Silver Mint Julep Cups. 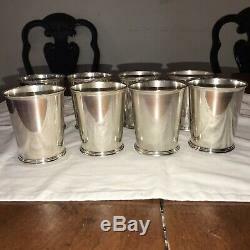 We are offering this rare set of (8) eight sterling silver mint julep cups from esteemed silversmith company S.
This company was founded in 1815 and it has produced some of the most coveted mint julep cups ever produced. These cups have been in our family for over 50 years and they would certainly be a welcomed addition at any Kentucky Derby party. We have priced this family heirloom to sell. This is a great investment for those of you that collect antique silver. We will be offering other interesting antique items in future auctions. 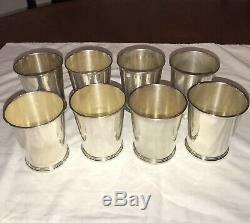 These cups are in excellent condition considering their age although a few of the cups have a few dents in the body of the cup or the bottom rim. We have documented all imperfections in the photos and can send additional photos if desired. 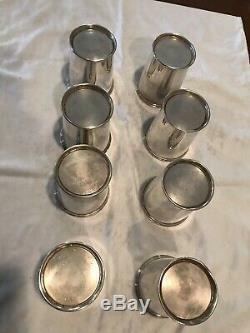 The cups are not monogrammed nor has there been a monogram removal. Each cup is 3-3/4 inches tall and 3-1/8 inches in diameter at the top rim of the cup. Each cup weighs 3.9 troy ounces for a total silver weight of 31.2 troy ounces. 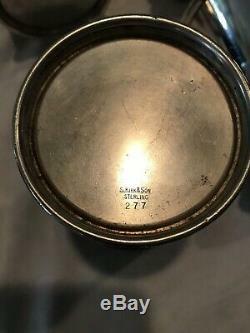 Kirk & Son hallmark as well as STERLING and the 277 pattern number can be seen in the photos. Feel free to ask questions, thank you.. The item "Rare Full Set Of 8! 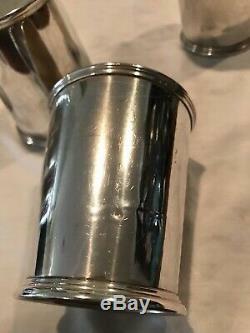 S Kirk & Son Sterling Mint Julep Cup No MONO! #277" is in sale since Wednesday, March 6, 2019. This item is in the category "Antiques\Silver\Sterling Silver (. The seller is "miamiestatejewelry" and is located in Miami, Florida. This item can be shipped to United States, United Kingdom, Mexico, Germany, Japan, Brazil, Sweden, Netherlands, Israel, Singapore, Switzerland, Norway, Uruguay.